Sunday's stage nine had barely started when a crash brought down several riders, including Richie Porte, André Greipel, José Rojas and Jens Keukeleire. 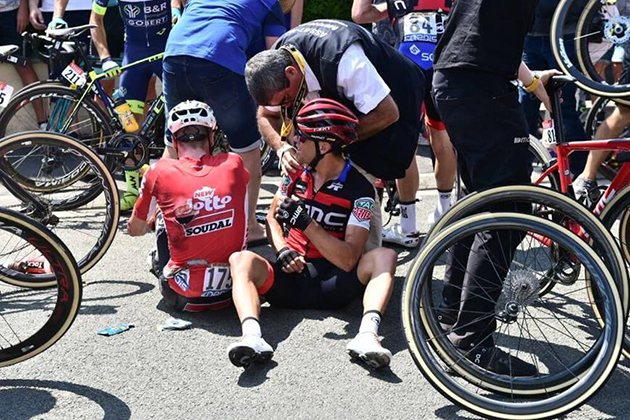 Porte suffered a bad shoulder injury, forcing him to abandon the Tour. Rojas later quit as well. We should have more details in our Monday news. Dylan Groenewegen has claimed his second consecutive stage victory in the Tour de France on the French national holiday. After his impressive victory in Chartres, the 25-year-old sprinter of Team LottoNL-Jumbo remained cold-blooded in the streets of Amiens. Only in the last few metres he got rid of his rivals and won again with a great display of power. For Groenewegen it’s his third stage victory in the Tour de France. It’s his eleventh win of this season and the twenty-second for Team LottoNL-Jumbo. Groenewegen was perfectly positioned by Paul Martens and Amund Grondahl Jansen after Timo Roosen hadn’t been able to do his part in the lead-out due to a crash. Groenewegen perfectly timed his sprint and won stage eight in a superior way. Dylan Groenewegen takes his second Tour stage in a row. Merijn Zeeman, Sportive Director of Team LottoNL-Jumbo, was delighted with Groenewegen’s two consecutive stage wins. “In 2016, we started the sprint project around Groenewegen. The intention was to go for stage victories in the 2018 Tour de France. The fact that he has now taken two stage wins after having won in the Tour last year as well, is very satisfactory. Especially because we have further developed him into the sprinter he is today after his first year with Team Roompot", he said. 14 July, 2018, Amiens Métropole (FRA): Greg Van Avermaet ensured he would head into the highly anticipated Roubaix stage in the yellow jersey tomorrow after crossing the line safely behind the bunch sprint in Amiens on Tour de France stage 7 today. It was a calm start to the day with the peloton covering 23km, of the 181km course, before three riders made the first serious move of the day to open up an advantage that was sitting at over 5'30" at the top of the Côte de Pacy-sur-Eure, the first of two category-four climbs. After tipping over the six-minute mark, the gap to the two remaining breakaway riders, Fabien Grellier (Team Direct Énergie) and Marco Minnaard (Wanty - Groupe Gobert), began to settle down as the sprinters' teams took control of the pacemaking. BMC Racing Team was maintaining a constant presence at the front of the peloton as the leaders' advantage was brought back to inside 1'30" and the catch was eventually made by a reduced main bunch inside the final 7km after a crash 10km earlier. It didn't take long for the battle for position to begin as the speed picked up going through the heart of Amiens and in the end, the predicted bunch sprint played out with Dylan Groenewegen (Team LottoNL-Jumbo) once again taking the stage win. 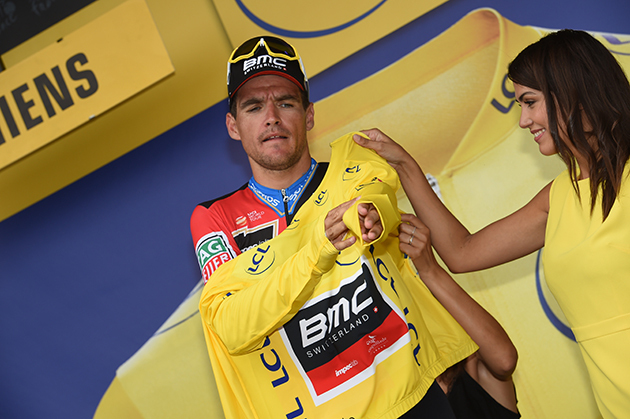 Greg van Avermaet takes his GC lead into stage nine. Van Avermaet, who extended his overall advantage to seven seconds after taking a bonus second at the sprint with 20.5km to go, will now head into his sixth day in the yellow jersey on stage 9 tomorrow. Richie Porte was once again looked after by his teammates all day and after finishing safely in the bunch, he moved up into 10th overall on the General Classification while Tejay van Garderen continues to sit third. "Everything is going well. I was hoping for one day in yellow but not as many as this. I am really enjoying it every day. It is something special and it will be great if I can keep it in Roubaix. It will be nice to go onto the cobbles with the yellow jersey and hopefully I get an extra day after tomorrow." "It is definitely going to be different as this is the first time that there has been this many cobbles on a Tour de France stage. You will have GC riders being protected by their team but they aren't going for the win, they are just going up there to not lose too much time. I think there will be a small group of riders who can have a little bit of freedom so it will be pretty strange. I think it is going to be really hectic, really fast from start to finish and I think positioning will be key on every sector." "For us, it will be a team effort. We are a team and have had a lot of guys working for Richie and me over these past few days. They are doing a great job so far and hopefully, we can keep up the good work tomorrow and get ourselves into position with Richie in my wheel. That would be the best and then he just has to try and follow for a long as possible and for sure, he can then maybe even gain time on the other contenders." "A lot of things can happen tomorrow and there will be a lot of stress around. I hope to be good. Having no problems, no crashes and no flat tires would be a great thing already and then if I don't have any of those problems, I think I can be up there in the final and hopefully, Richie is with me." "I think calm at the start means that it's hectic in the final but we did a super job as a team today. Greg took another bonus second and the guys really did a great job. Michi Schär, Stefan Küng and Paddy Bevin really rode super well today. We stayed in a great position and tomorrow is another day but it is nice to get through to where we are at now." "It's nerve-racking going into tomorrow's stage. It's not what we are used to but we have the team for it. We've got some of the strongest guys in the race so hopefully, we stay out of trouble." Stage 8 of the Tour de France ended in frustration for Quick-Step Floors, despite our team being one of the favourites for victory and riding accordingly, with Tim "El Tractor" Declercq taking the reins in the peloton early and setting the pace behind the three-man breakaway which was reeled in inside the final ten kilometers. The stage was quiet until with 20 kilometers to go, when a crash brought down several riders, including Julian Alaphilippe. The Flèche Wallonne winner remounted and began chasing the bunch as part of a group that was involved in that incident, but couldn't rejoin the bunch, which was speeding on the streets of Amiens, a stage finish at the race for the 11th time in history, and lost his position in the top 10 overall. A hectic sprint unfolded inside the last kilometer, with Fernando Gaviria finishing third only to be relegated by the race jury and placed last in the group following an incident with Andre Greipel (Lotto-Soudal), which sports director Tom Steels commented after the stage: "The sprint was very nervous, because it was the last opportunity for the fast men until next Sunday and many wanted the win. The huge pressure that is on the sprinters in this race can cause incidents, like the ones we saw today. Nevertheless, we remain motivated for the next stages and keen on fighting for other good results. The Tour is far from being over." After giving it everything over the remaining part of the course, Martin managed to make up significant ground on his GC competitors, but still crossed the line 1:16” down. On Bastille Day, you can normally expect the French teams to inject some excitement into the proceedings, and as expected, there was a French rider in the break. 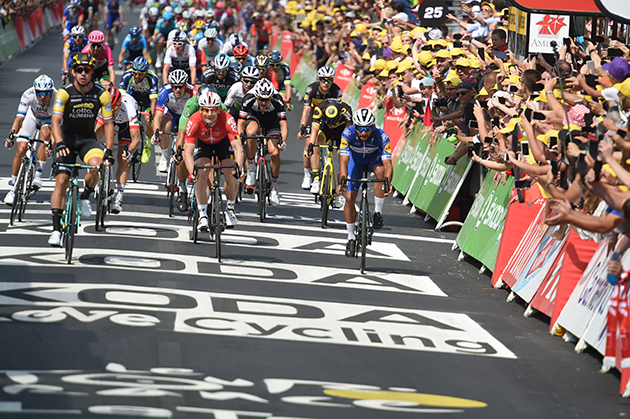 While the escape held the peloton at bay as long as they could, the sprinters had earmarked this stage for themselves, and once the final kilometres came into view, there was no stopping them. The UCI World Champion, Peter Sagan, was in a good position ahead of the finale, but a long sprint effort saw him passed shortly ahead of the line. However, having taken fourth on the line, a declassification saw him promoted to second position. His points in both the finish and intermediate sprint confirmed his Green Jersey for another day. In the overall standings, Rafał Majka gained a spot to put him in eighth, with just a few days before the GC race really starts to take shape. 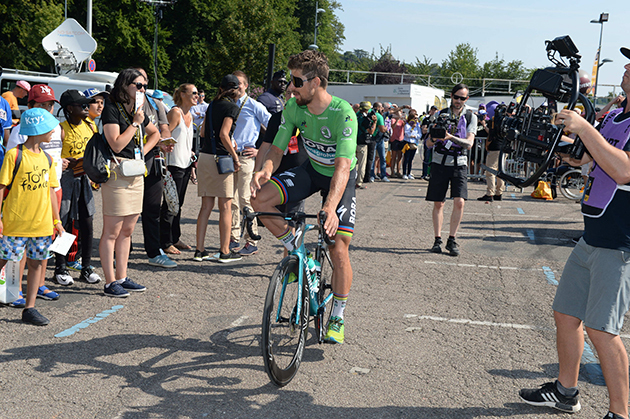 Peter Sagan heads to the the start of stage eight. The classification for today’s stage was ‘flat’, but this didn’t mean the day would be easy. You could be certain that the French teams would try to make themselves known on Bastille Day, while yesterday’s long effort would make every pedal stroke an immense effort, and that was before taking into account the two categorized climbs which, while not particularly steep, averaging 4.3%, were long for their classification. Shortly after the second climb would be the day’s intermediate sprint, requiring teams to regroup to get their sprinters into position – a challenge after the day’s climbs. Undulating terrain followed before a gentle downhill brought the peloton towards the predicted sprint finish after 181km of racing. While riders would be looking forward to the first rest day, there were still some hard days of riding to contend with, while the opportunities for the sprinters were starting to disappear as the race was heading into more hilly terrain in the second week. This would make the predicted sprint all the more chaotic, and so it was important for the BORA-hansgrohe team both to make sure Rafał Majka was kept safe so that he could go on to ride hard in the GC race, while also delivering Peter Sagan into position so that he would be in contention for the sprint. Earlier in the day, the team would be aiming to make sure Peter was delivered to the intermediate sprint in a strong position. To inject a little more excitement into proceedings, Marcus Burghardt decided to go on the attack when the flag dropped to start the stage. While the German rider clearly had the legs to make an impact, he decided to drop back to the peloton to allow other riders the chance to escape. He didn’t have long to wait, as a small group, eventually becoming just two riders, made their way out, building a lead that topped out at six minutes. Delivered to the intermediate sprint by his BORA-hansgrohe teammates, Peter Sagan took fourth spot, tightening his grip on the Maillot Vert. As the day went on, the break’s lead fell steadily until the peloton was in touching distance. The catch made with 6km remaining, teams started gearing up for the sprint as the character of the route changed to challenging streets with tight turns and road furniture. The speeds increasing and the finish line in sight, the UCI World Champion, Peter Sagan, went from 300m out and was able to put some space between himself and the other sprinters, but this long and early push allowed his rivals to use his slipstream and pass him, the Slovak rider having to settle for fourth position after this hard effort. However, due to an incident in the finale where Gaviria and Greipel, who ultimately finished ahead of Peter in the sprint, were jostling for position, both were relegated, pushing him into second on the stage and extending his lead in the points contest. In the GC race, Rafał moved up one place to eighth, just one second off seventh spot. After a fast start and once again many attacks, finally a breakaway of three riders formed a one-minute lead over the peloton. The race passed through a rain storm, which saw the peloton split slightly and the trio were finally reeled in with 15km remaining. Today was the first time in history the women headed up the climb from the Ovaro side like the men's peloton earlier this year in the Giro d'Italia where Simon Yates finished second. The only other time the Zoncolan was used in the women’s race was back in 1997 when the riders headed up the climb from the other side. As the riders started the climb, a high pace was set by Boels-Dolmans with Megan Guarnier causing the front of the race to reduce to around 15 riders. On the first real steep section it was Ashleigh Moolman-Pasio (Cervelo-Bigla) who made a big acceleration with only van Vleuten able to follow. With confidence after dominating in the uphill time trial on Thursday, van Vleuten waited patiently before accelerating away from Moolman with two kilometres to go and to an emphatic solo stage win. Teammate Amanda Spratt also fought on behind, crossing the line in third place to jump back up into third place overall with one stage remaining. Van Vleuten now heads into the 10th and final stage with a three minutes 35seconds advantage over her rivals. “It’s awesome that the Queen Stage was organised on such a famous climb like Monte Zoncolan, it’s really good for women’s cycling and makes the day unforgettable. It is such a hard climb, so steep that it was difficult to put pressure on the front wheel. “I was a little bit worried because I didn’t feel good on yesterday’s stage, but the girls did a great job of looking after Annemiek and myself throughout the day and they led us perfectly onto the climb.